The seemingly endless beach invites guests for a leisurely stroll before taking a refreshing swim in their private pool. Fringed by palm trees, an elegant gazebo houses a relaxing dining area where guests can enjoy al-fresco dining at any time of day or night. An outdoor bar and barbecue area complete the setting for the ideal island living experience and quality moments together. In the shade of the well designed terrace, guests will enjoy the chic yet comfortable outdoor furniture and dining area. The interiors bring together muted shades and sleek wooden furniture, creating an atmosphere of tropical elegance. Guests at this villa will benefit from exclusive facilities and services that match the luxurious yet understated atmosphere, including a dedicated valet throughout their stay as well as the services of a chef on request. The master bedroom looks out onto the terrace and the beach beyond, offering a view to be prized each morning. Decorated with style, this room offers a romantic haven of peace and intimacy to parents with a spacious bedroom and en-suite bathroom offering a bathtub, separate shower and walk-in wardrobe. Equally stylish and comfortable, three other bedrooms and two more bathrooms offer each of the guests their own space and privacy. 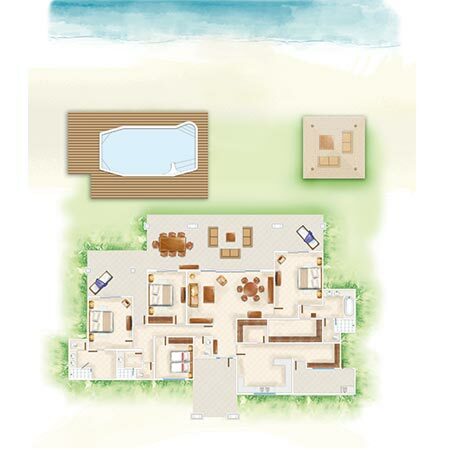 The Dinarobin Villas are a luxury home away from home, offering the ultimate in comfort, island living and service.